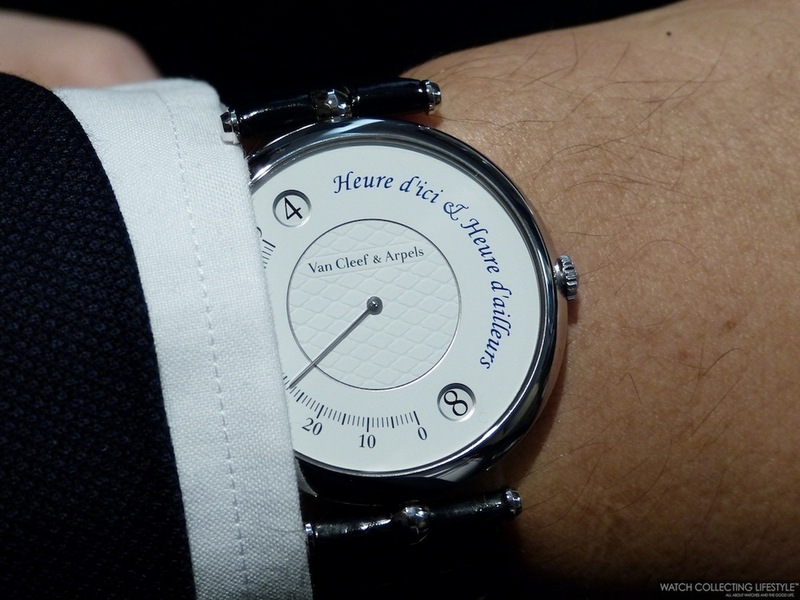 SIHH 2014: Van Cleef & Arpels Presents the Pierre Arpels Heure d'ici & Heure d'ailleurs. Live Pictures and Pricing. Created in 1949, the Pierre Arpels watch has epitomized Van Cleef & Arpels’ vision of masculinity. A perfect blend of sophistication and understatement, it is notable for an exceptionally thin case held by two unobtrusive central strap attachments. In 2012, the Maison reinterpreted this icon of watchmaking and has since enriched the collection with new models that reflect Pierre Arpels’ way of life. An aesthete, designer and businessman, Estelle Arpels’ nephew was also a socialite and a traveler: two facets to which Van Cleef & Arpels pays homage at the SIHH 2014 with this new timepiece the Pierre Arpels Heure d’ici & Heure d’ailleurs in an 18K white gold case measuring 42 mm in diameter. With this new Heure d’ici & Heure d’ailleurs timepiece, the Maison presents an understated and poetic interpretation of travel —the way that Pierre Arpels appreciated it. For the first time, the Pierre Arpels collection welcomes a dual time complicated watch, reflecting Van Cleef & Arpels Poetry of Time. Developed in partnership with Agenhor —Atelier Genevois d’Horlogerie—, this exclusive automatic movement is distinguished by its double jumping hour and minute retrograde display on a beautiful white lacquer dial with 'piqué' motif on the center. The hour that acts as the reference —displayed in the aperture at the top of the dial— and the hour of the second time zone that appears in the lower aperture both jump at the same time, thanks to a single sector that synchronizes the two hour discs and the retrograde minute hand. When the latter reaches 60 minutes on the graduated scale, it returns to its starting position at the same instant that the hour display changes. In order to maintain the thinness of the case —a distinguishing feature of the Pierre Arpels collection— the automatic movement is equipped with a platinum micro-rotor that takes up remarkably little space. By oscillating in two directions, it can supply energy continuously. The movement, which is visible through the display case back, is adorned with a snailed pattern on the bridges, the Van Cleef & Arpels hallmark and a blue lacquered design on the micro-rotor that echoes the 'piqué' motif on the dial. The watch is fitted with a super glossy black alligator strap with pin buckle. The strap is very comfortable and nicely finished to match the exceptional look of this new timepiece. 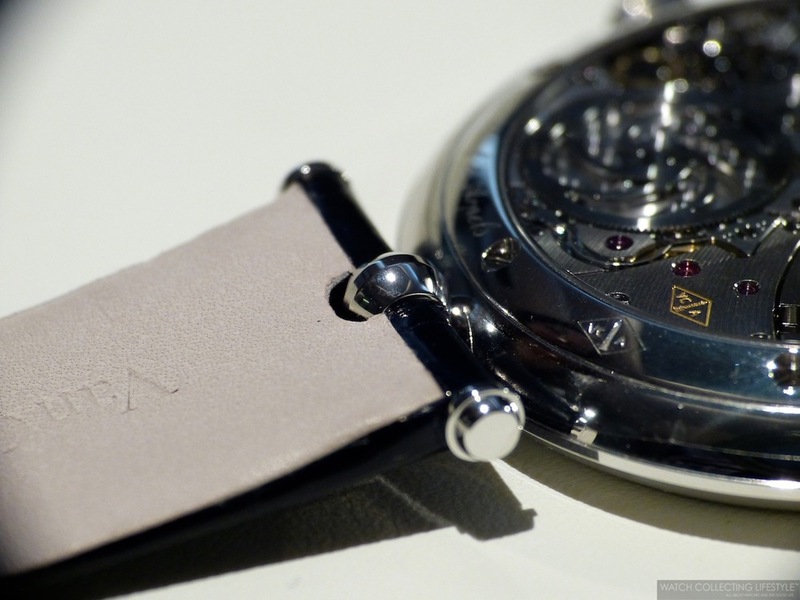 On the wrist, the watch wears true to its size and with a very thin profile. The understated elegance of this timepiece is remarkable and the wrist presence incomparable. The Pierre Arpels Heure d’ici & Heure d’ailleurs is definitely a timepiece that embraces the principles of this Maison and a perfect example of 'haute horlogerie'. Sticker Price $41,000 USD. For more info on Van Cleef & Arpels click here. Posted on February 5, 2014 by Editor & Publisher and filed under SIHH, Van Cleef & Arpels and tagged Pierre Arpels VC&A Pierre Arpels Heure d’ici & Heure d’ailleurs. Atelier Genevois d’Horlogerie.